Christmas isn’t Christmas without at least one rendition of Charles Dickens’ “A Christmas Carol”, so where better to visit in the run up to Christmas than the Charles Dickens House in Bloomsbury. Come Christmas the Charles Dickens House is decorated in high Victorian style. Stepping across the threshold of 48 Doughty Street in December is to enter Christmas past. Sprigs of holly and candles are everywhere you look. The drawing room boasts a magnificent Christmas tree. Presents containing toys for the Dickens children crowd around the base of the tree. For the full Dickensian Christmas experience you can visit in the evening when flickering candle light illuminates your way. Even as I walked along the Bloomsbury Streets before getting to the candlelit house it felt as if I’d entered a time warp and that Mr Dickens might walk around the next corner. Even the dining table is set awaiting the great man and his friends, although I doubt they would have had personalised plates! Visiting the Dickens House at any time of year, or day, offers the opportunity to glimpse behind the front door of a grand London terraced house. ‘Housemaid Tours’ are on offer throughout the year, or you can simply wander around learning about Dickens’ life from the son of a man thrown into debtors prison to the grandest literary lion in town. 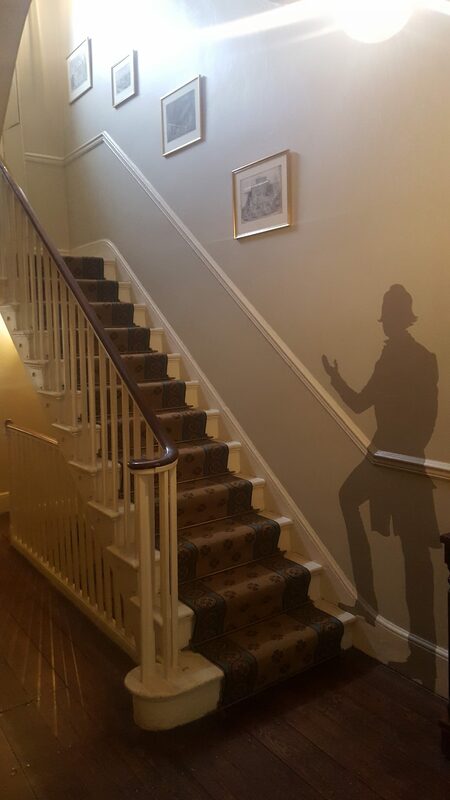 I especially like the shadows of Dickens that invite you to explore a little bit more of the house. 2018 see’s the 175th anniversery of the publication of A Christmas Carol, to celebrate the Dickens Museum has a special display all about food and how it featured in Dickens’ novels. From Oliver Twist wanting more to Christmas Carol Christmas Day Goose with lots of candied sweetmeats inbetween. Doughty Street might be a little off the beaten track for many people, but fear not there is a very pleasant café at the back of the museum. It even has a courtyard garden to sit in, the perfect place to bring a laptop and work on your own novel perhaps? It is one of my Top London Museum Cafe’s, click on the blue words for the others. To read about visiting the Charles Dickens Museum when not dressed for Christmas click here. Open: December every day except Christmas Day and Boxing Day 10am – 5pm.